Bioluminescence refers to the ability of living things to produce light and represents a fascinating and profoundly useful area of biophotonic research. Not only is it of interest to study and record the bioluminescent emission of organisms in their natural environment (~ 90% of deep sea marine life exhibits bioluminescence), but several of the individual biomolecules that give rise to bioluminescence have been identified, isolated, studied, often genetically coded, and put to use across a range of applications. These uses have penetrated a broad field of study, including intracellular physiology, pre-clinical research, microtitre and biochip-based assays, and even art!A well-known bioluminescence, and one that has been ubiquitously harnessed for research purposes, is that induced by the luciferase enzyme. For example, firefly luciferase emits light in the presence of its substrate luciferin & Adenosine TriPhosphate (ATP) and is widely used for measuring ATP concentrations. Since all living organisms contain ATP it finds principle use as a measure of bio-contamination, for example in the food industry. Importantly, luciferase has been coded and adopted as a gene reporter, routinely transfected into living organisms and cells to study, for example, expression levels and cell physiology. Serial dilution of luminescent biomarker HRP in illuminol/peroxide showing effect of increasing EM gain factors from x1 to x500. At x1 gain setting the lower concentration wells on the right hand side of the microtiter plate are indistinguishable from the noise.By increasing the gain of the EMCCD, these wells become clearly visible above the noise floor. BRET can offer some attractive advantages over Fluorescence Resonance Energy Transfer (FRET) based assays. An example of BRET might use a bioluminescent luciferase that is genetically fused to one candidate protein, and a Green Fluorescent Protein (GFP) (or mutant of) fused to another protein. When the two proteins bind, the luciferase excites luciferin, which transfers its excited state energy to GFP causing it to emit efficiently in the green. GFP-Aequorin is a conjugate often used for Ca2+signalling. In the jellyfish Aequorea Victoria, the chemiluminescent Ca2+ binding protein aequorin is associated with GFP. Upon binding to Ca2+, this calcium-activated protein converts the chemical energy stored in coelenterazine into an oxidized form of coelenterazine. If GFP were not present, oxidized coelenterazine would emit blue light but with low quantum yield. However when GFP is nearby (as it is in vivo), excited state energy is instead transferred to GFP, which then emits more efficiently in the green. A calcium-sensitive reporter gene has been constructed coding for aequorin fused to GFP. Such a bioluminescent genetic marker can have the advantage over Ca2+ - specific fluorescent dyes of being easily targeted to specific cells and sub-cellular compartments. With the negligible background, sub-second exposure times can be enough to record the signal in single cells expressing any of the fusion proteins, especially when using Electron Multiplying CCD (EMCCD) technology to detect. Production of visible light by a chemical reaction is called chemiluminescence (in fact, when a reaction of this nature occurs in living organisms, it is called bioluminescence). Chemiluminescence occurs when an energetic (exothermic) reaction produces a molecule in an electronically excited state. That molecule, as it returns to the ground state, releases its energy as a photon of light. The rate of production of light and concentration of chemiluminescent molecule, often coupled to concentration also of a catalytic reagent, imposes limits on the amount of time that this luminescence can be usefully observed from a sample volume. Some samples will generate a relatively bright signal for a short period of time (until all of the chemiluminescent reagent is used up), others will yield a weaker signal over a longer period. For the latter it can be more important to use a deep cooled CCD, capable of accumulating over a long period without significant darkcurrent build-up. Sonoluminescence refers to the emission of light by tiny bubbles in a liquid excited by sound. Thermoluminescence is observed when certain minerals, having previously been exposed to high-energy radiation, release energy in the form of visible light when heated. Thermoluminescence has been used as a means of archaeological dating. Triboluminescence is the emission of light energy when a mechanical stress is applied to a crystal, the crystal stressed by applying pressure or torque. Biochip assays. Electrophoresis Gels. Microscopy. 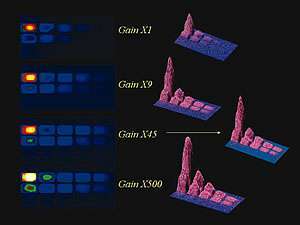 Microtitre plate assays. Petri dish assays. Whole plant/animal imaging. Common to all of these approaches is the fundamental need for both a sensitive CCD detector and a light-tight imaging environment, the latter often provided by an imaging dark box (even to house a microscope). Quantum Efficiency and Fluorescent Dyes relevant to Bioluminescent & Chemiluminescent Imaging. With bioluminescence and chemiluminescence, light is emitted directly by the specimen without the need to put in excitation light first of all. In terms of signal to background, this carries a key advantage in that there are no sources of undesirable autofluorescence background emission or scatter. Photobleaching and phototoxic effects (in living cell studies) are also markedly minimized. The lack of autofluorescent background in turn puts the emphasis very much on the CCD detector to operate with minimal sources of detector noise, since it is the CCD noise floor that is most likely to represent the true detection limit (as opposed to background photon noise). This means that:1. Read noise has to minimized relative to the amount of photons collected over a given exposure time.2. Darkcurrent must also be fundamentally low, especially if long exposures are used and/or if EMCCD technology is being utilized. Furthermore, since luminescence is typically a relatively weak phenomenon, a high Quantum Efficiency (QE) is desirable in order to generate a high signal-to-noise (S/N) within a relatively short exposure time, assisting both dynamic intracellular processes and/or sample throughput. There are several back illuminated Andor CCD formats suited to ultrasensitive imaging of bio/chemiluminescence, depending on the type of experiments you are conducting. 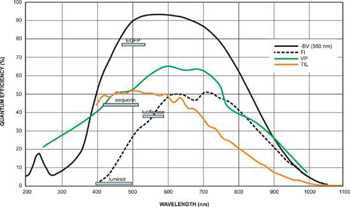 Figure 2 shows a QE curve representative of Andor's recommended back illuminated CCD and EMCCD cameras for luminescence.